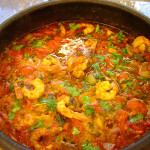 Moqueca is a Brazilian fish stew recipe. Cut fish into thick slices, season with lime, salt and pepper. Let stand in fridge for 1 hour. 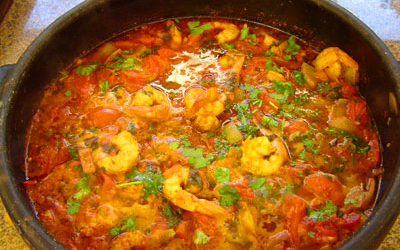 In a bowl, mix red peppers, onions and tomatoes. Add coriander, parsley and chive. Mix well. Spread some of the mixture over the bottom of a large clay pan. Add one layer of fish, one layer of the mixture, successively. Pour oil over and cook at low heat, for 30 minutes. Turn stove off, cover tightly, and let stand for 2 hours. Turn stove on, when it starts to boil, add the coconut milk and the dende oil.